If Bollywood gets you excited, then Quarter Canteen, the new kid on the Bandra block, is the place for you. The blue entrance has a ‘welcome’ written in bold along with painting of typical old school girls offering flowers, the first glance at the place has you convinced that this door is going to open up into something interesting. Once inside, you will be greeted by dramatic walls with graffiti of iconic filmy characters with their dialogues that will involuntarily mime in your head as you read along. They have spacious seating which makes this place a great catching-up place, and they play Bollywood music that gels with place nicely. To make things even better, they have a valet, so you don’t ruin your evening worrying about parking. And they also do a live sports screening, so what more do you want? Nothing elaborate, Quarter Canteen serves Indian and Chinese cuisines with a fair share of seafood. Their tandoor preparations are recommended. The vegetarian options are up for grabs for INR 255, and non-vegetarian ones for INR 265. Their Paneer Chilli Dry is a crowd favourite, just like the Murg Reshmi Kebab. They also have an old-school Indian menu for a proper meal that will satiate your hunger for sure. Chinese appetisers are priced at INR 255 onwards for vegetarian, and INR 265 onwards for non-vegetarian choices. And what we really love is that their menu is no-brainer, because they have steered clear of calling dishes by fancy names so you exactly know what you’re calling for. The highlight of this place lies in their cocktail menu. Swearing by their theme, they have an exciting range of cocktails all priced at an affordable INR 199. While Sassy Santra, Saunf & Sound, and Blue Balma are vodka based, their Teekha Mexican and Kiss of Gulabo are based on tequila. And then comes their Old Monk based cocktail which is Tharra Colada. The best part? All the mocktails are served in a quarter bottle. Apart from this, your brand-conscious choices will be handle by their full range of liquor. If Basanti wants to dance while hogging on comfort food and getting tipsy on filmy cocktails, then Quarter Canteen is your best pick. If you engage with the bartender nicely, they’ll be happy to adapt their funky cocktails into mocktails for the teetotallers in the house. 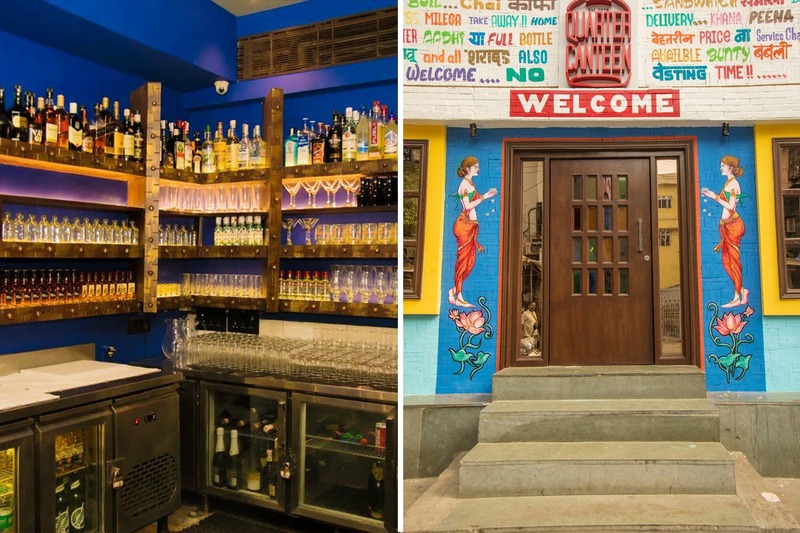 Quarter Canteen Serves Alcohol Starting 9 AM For As Low As INR 40!